Need for Speed is back after a two-year break. Developer Ghost Games returns with another cinematic entry in the long-running and best-selling franchise. We went hands-on with the game while at EA’s PLAY event just prior to E3 2017, and have some impressions ready for you below. Our hands-on portion only involved a single race. While it wasn’t a story level, it was long enough to get used to Payback’s driving mechanics. We drove a Mustang, which had some heft to it. Drifting was simple to initiate by a press of the X button on an Xbox One controller used in the demo – we were playing an early build of the game running on PC. So this would translate to pressing Square on the PS4. As in most Need for Speed games, you are rewarded for performing risky moves such as driving against traffic, having near-misses with other racers and traffic, and generally driving daringly or competitively. Once you earn enough turbo, holding down the A button (Cross on PS4) uses as much or as little boost as you desire. Payback’s physics can definitely be described as arcade-like. 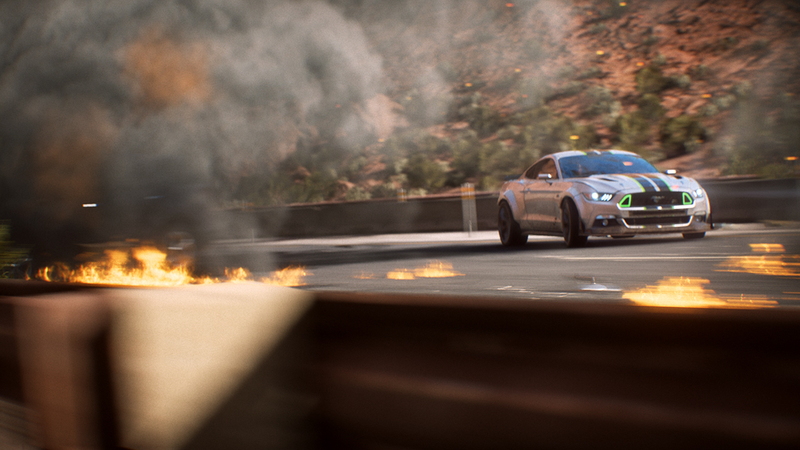 Need for Speed usually focuses on having fun driving versus being a simulation, and Payback falls in line with that. The physics felt realistic enough to ensure that those with higher driving skills could do better than those just flooring it, but simple enough that anyone could pick up the game and have some fun busting out slick-looking moves. While playing, as well as watching others play, I couldn’t help but notice that the player’s car didn’t appear to receive much in the way of damage despite slamming into opponent cars, road dividers, and other obstacles. When asked, a representative for Ghost Games told us that in their testing, they found out that people don’t like to see their cars all banged-up. After spending hours customizing a ride, the last thing you want to happen is have one bad turn mess up how your ride looks or drives. Need for Speed is about the fantasy of driving like a madman, and Payback attempts to drive that point home with an emphasis on driving dangerously on the edge of control, while perhaps worrying a bit less about potential consequences.